Blending of coals is necessary from economical point of view by reducing the percentage of high cost, prime or hard coking coals and replacing it with medium or soft coking coals. In some coke oven plants even a small percentage of non-coking or steam coals have also been used in the blend. Selection of a proper coal blend for use in by product coke ovens is always a big challenge for the coke producer since the blend has to meet the following requirements. It is to meet the requirement of crushing during coal preparation. All the components of the coals are neither be over crushed or under crushed. The sized coal blend for charging the coke ovens is to meet the requirements of density, flow, and the size fractions. It is to have necessary coking and caking properties for producing coke of quality which meets the quality requirements of blast furnace (BF) coke. The three basic quality requirements of BF coke are (i) to provide heat for the endothermic reactions taking place in the blast furnace, (ii) to act as a reducing agent by producing the necessary reduction gases, and (iii) to provide a permeable support in the BF for the iron bearing burden. It is to provide safe pushing performance in coke ovens. It must not put excessive pressure on coke oven walls during the process of coking and damage them. It should meet the yield requirements not only of BF coke but also of coke oven gas. A proper coal blend will not produce excessive nut coke and coke breeze. It is to be economical. In view of the above varied types of requirements, the decisions regarding coal blends are not taken on ad-hoc basis but after careful considerations. In fact coal blend need to be designed so that a balance can be achieved between the competing sets of requirements such as throughput, high quality, and cost efficiency etc. while keeping importance of the battery life in mind. Normally, the coal blend design is done through a series of steps. These steps are also required for any addition of new coal in the blend and are explained below. Study the quality of the coals to be included in the blend as per the quality data sheet of the coals provided by the supplier. Based on the data sheet the quality is assessed for the use of coal in the blend. Also the cost and long term availability of the coal is determined. Once these parameters are preliminary satisfied then a 5 kg sample is requested. From this 5 kg sample, different laboratory tests are conducted to determine the coal qualities and also to get assured that these qualities are as per supplier’s data sheet. These test results decides how much percentage of coal can be used in the coal blend. A preliminary economic evaluation is then carried out for the coal. On getting a satisfactory evaluation sufficient quantity of coal is ordered for pilot oven carbonization tests. Pilot oven carbonization tests are normally conducted (i) on 100 % of new coal, as well as (ii) on the coal blend with the percentage of new coal planned in the blend. During the pilot oven carbonization, contraction and gas pressure tests are also conducted. If the pilot oven carbonization tests are successful then coal is used in the planned percentage in the coal blend for the plant trials. During the plant trials close monitoring of all the parameters is carried out. Once plant trials are successful, the coal is adopted for regular use in the blend. However final selection of coal for addition into the blend also takes into account price, coal preparation plant requirements, and quality control needed during procurement. The properties of coal which are required to be focused during the coal blend design are given below. The physical properties of coke which are important for stable blast furnace operation are (i) coke reactivity index (CRI), coke strength after reaction (CSR), and (iii) micum index. CRI measures the ability of coke to withstand breakage at room temperature and reflects coke behaviour outside the blast furnace and in the upper part of the blast furnace. CSR gives indication of the strength of coke after being exposed to the reducing atmosphere of the blast furnace. It measures the potential of the coke to break into smaller size under a high temperature CO/CO2 environment that exists throughout the lower two-thirds of the blast furnace. Micum index is a drum test and indicates coke strength at room temperature. Larger values of M40 (percentage of coke remaining on the +40 mm round hole after 100 revolutions) and smaller value of M 10 (- 10 mm round hole coke after 100 revolutions) normally indicate coke with higher strength. Petrographic analysis of coal is a major tool for predicting coke strength. The important properties of coal for the prediction of coke strength are as follows. Maximum dilatation – The value of maximum dilatation is 55 % minimum. It depends on the value of maximum dilatation of the coal blend components. Maximum fluidity – The value of maximum fluidity is 600 ddpm minimum in coking coals. Higher fluidity gives better flowability in the coke ovens. Mean Maximum Reflectance (MMR) – The value of MMR in coking coals vary in the range of 0.85 % – 1.35 %. Soft coking coals have lower MMR while hard coking coals have higher MMR. Vitrinite – The value of vitrinite in coking coals is 50 % minimum. For soft coking coals the limit is 45 %. Vitrinite distribution (V9 – V14) – The value of vitrinite distribution in coking coals is 70 % minimum. The as-formed size of the coke is influenced by the amount of inert components present in the coal blend. As the inert content decreases, the size of coke decreases. Thus, the coal type influences the coke size. The coke size is also highly dependent on operating variables. In normal practice, the coke size for blast furnace is mostly controlled by screening. The amount of coke produced in a coke oven is inversely proportional to the coal volatile matter. The coal volatile matter range is also important for the production of high strength coke. Coal volatile matter also influences the yield of coke oven gas which is often an important parameter for the gas balance in the steel plant. With a physically stable set of raw materials in the blast furnace, further control of the blast furnace process is achieved through control of the chemical properties. The most important coke chemical properties are moisture, fixed carbon, ash, sulfur, phosphorus and alkalis. Most of these properties are primarily dependent on the coals used. Coke ash, sulfur, and alkalis affect CSR negatively. However, phosphorous affects CSR positively, but it is undesirable as it goes completely into the hot metal. 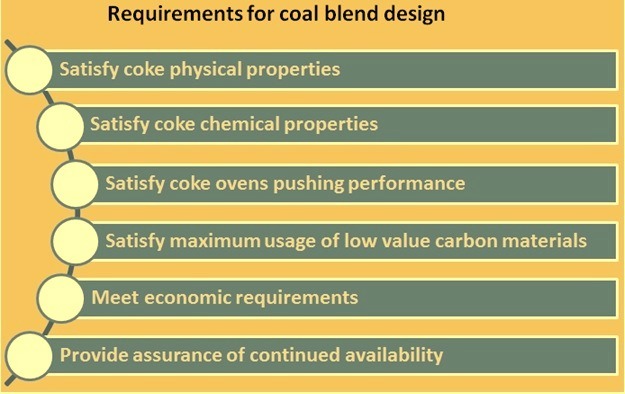 In order to obtain a high quality coke with high yield, it is desirable that the coal blend should contain low amounts of moisture, ash, sulfur, alkalis, phosphorus and high fixed carbon content. Further ash fusion temperature is an important property for the process of coking. It is to be higher than the coking temperature. The maximum coking pressure is not to exceed 0.14 kg/sq cm. Of all the inherent coal properties, rank and inert content appear to be of primary importance for the coking pressure on the coke oven walls. The rank has a direct relation with coking pressure. Low volatile coals exert excessive coking pressure. However, they also contribute to high coke strength and produce high coke yields. Coals of similar rank but possessing high inertinites produce lower pressure. Australian low volatile coals generally produce low wall pressure and are included in blends to reduce the coking pressure. Because of the difficulty of measuring the coking (wall) pressure in a commercial oven, the wall pressure and gas pressure measurements from a pilot oven are usually correlated with gas pressure measurements in commercial ovens. Once the correlation is established, the gas pressure measurements at the commercial facility are used to monitor the coking pressure. Gas pressure increases with rank and decreases with inertinite content. Coal charge contraction occurs during two different phases of the process of coking. The first phase is present during plastic layer formation and is mainly dependent on coal properties. Once the plastic layers have transformed to semi-coke, the second phase begins during the shrinkage of the semi-coke and is mainly dependent on the operating conditions. Generally maximum fluidity values are used to predict the first phase of the lateral contraction. The vertical shrinkage is mainly dependent on operating parameters such as coking temperature and heating rate. In order to lower the operating costs while maintaining the coke quality, low value carbon materials are added in varying amount to the coal blends. Soft coals, coal fines, coke breeze, coal tar, petroleum coke, asphaltenes (distillation residues), and non-coking coals have been shown to have a positive effect on coke quality and coking operation, provided they are added in the right amount and to the right kind of blend. Such practices have resulted in lower cost, better operation, and conservation of resources. Oxidized (weathered) coals are also to be considered as low value carbon material as the oxidation generally results in a drop in CSR, stability, coke size, coke yield, and generally worsens the expansion and wall pressure characteristics. CSR is most sensitive to coal oxidation; the magnitude of CSR drop is higher for the lowest rank coals. Hence, the use of oxidized coal is to be minimized. The technological evaluation of the coal blend is to be supplemented by an economic evaluation for the utilization cost of the coke produced. A coal with low per ton cost may not be economical when the coke produced from it and its usage in the blast furnace is considered in an integrated manner. This is because coal quality can affect adversely coke yield in coke oven battery and BF coke consumption in blast furnace, besides also affecting adversely the productivity of blast furnace. Hence coal blend design is to ensure that it is ultimately economical at the point of use and not that it appear economical at coke ovens. The coal blend which produces coke with highest potential cost savings at the blast furnace is normally is to be adopted for implementation at the coke plant. To avoid frequent changes in coal blend, coals which are not available on long term basis, are to be avoided to be considered for inclusion into the blend. The procedure described above for the selection of coal for inclusion in coal blend in coke making explains that there is a necessity to achieve a balance between the requirements of throughput, high coke quality, battery life, cost efficiency, and overall economics with an assurance of a consistent supply of the coals.